What is the ideal home application for PE service? For homeowners with hard water who want a solution that provides minimal maintenance that’s 100% maintained by Rayne. For homes, businesses, and places where traditional water softeners may be prohibited due to salt or brine limitations, water rationing, or strict water-usage requirements. What do I need to buy have available for this service? Nothing!! Our systems work without electricity and NO drain is ever needed. Also, this service requires NO SALT! What areas do you provide PE Tank Service? 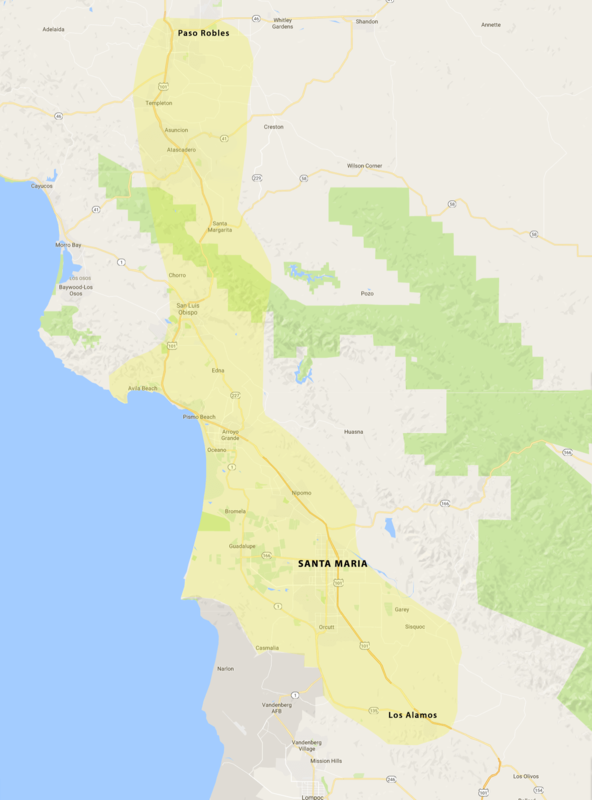 Rayne of Santa Maria provides Portable Exchange Tank Service in Santa Maria, Northern Santa Barbara, San Luis Obispo Counties, Nipomo, Arroyo Grande, Grover Beach, Pismo Beach, Shell Beach, Oceano, Paso Robles, Templeton, Atascadero, San Luis Obispo and surrounding areas. See our map here for all our service areas. Do I have to worry about HOA Regulations? Portable Exchange Service is permitted nearly everywhere – even in places where traditional water softeners are heavily restricted or not allowed at all. Rayne delivers and installs your PE tank – even when you are not home. Service is available on a 7-, 14- or 28-day cycle, based upon your needs, your budget, the number of people in the home, and the hardness level of your water. Whatever kind of home or business you have, we can customize a Portable Exchange Service schedule to work for you. Flexible and convenient water softening. Requires minimal installation that’s all handled by us. No extra water usage – can be used in areas where water is rationed or tightly regulated. No added utility cost since it doesn’t use your electricity. Perfect for communities with brine or saline discharge limitations. What kind of service and emergency support do you provide? We are available to you 24/7 for emergency service. Call us any time or any day. You Call – We Come!